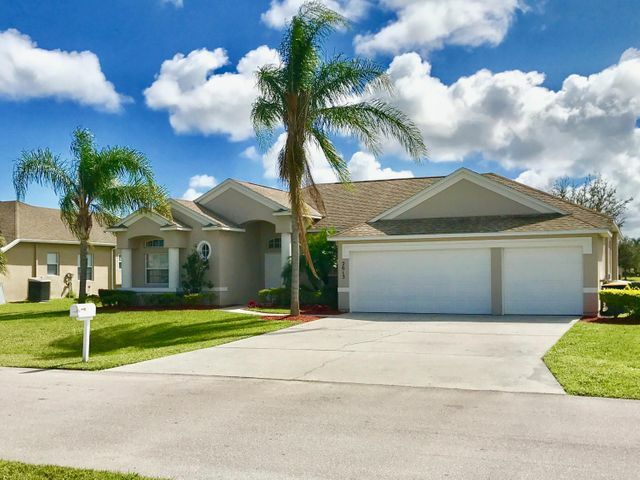 2613 Serenity N Circle is a four (4) bedroom, three (3) bathroom home located in the community of Palm Gardens in Ft Peirce. Inside you'll find an open style floor plan with many windows that allow in natural sunlight. Corian counter tops, stainless steel appliances, and a large center island can be found in the spacious kitchen. The master bedroom has sliding glass doors to access the patio, which overlooks the lake. Entertain guests on the covered back patio, located in the large, fenced back yard. Additionally, this Ft. Peirce home has a three car garage. Book a viewing appointment with a Distinct Estates agent today, as this property won't last long!